Gov. Andrew M. Cuomo responded Tuesday to Mayor Bill de Blasio's venting about their strained relationship and a failed city agenda in Albany by chiding his rival for not seeking bipartisan compromise. "Welcome to Albany," Cuomo told reporters in a message directed at de Blasio, a fellow Democrat. "We have a situation in Albany where you don't always get everything you want," the governor said after an event in Greenwich Village. "That's called life." 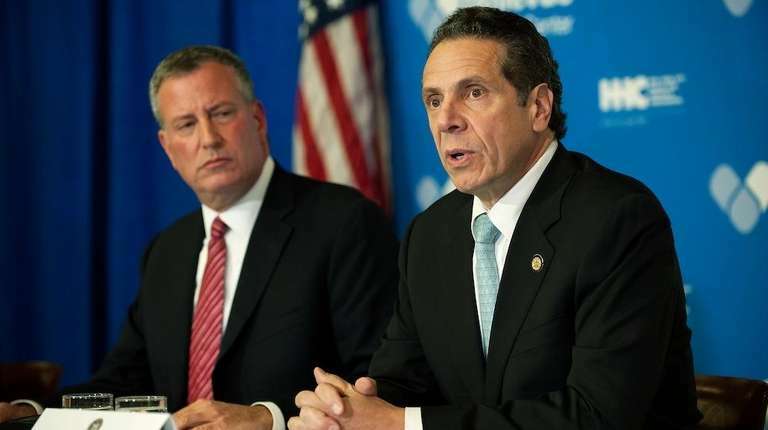 De Blasio's comments to reporters June 30 came after Cuomo didn't deny he and his team were behind unattributed quotes in news reports disparaging the mayor as "incompetent" and clueless on how to maneuver in Albany. On NY1 News last week the mayor accused Cuomo of "some kind of revenge or vendetta" against New York City. De Blasio told City Hall reporters that he had increasingly dashed hopes of a "strong partnership" with Cuomo, his boss in the 1990s at the U.S. Department of Housing and Urban Development. "I've been disappointed at every turn," de Blasio said. The governor Tuesday painted himself as a consensus-builder in contrast to de Blasio. "I have had extraordinary success working with my colleagues on a bipartisan basis and reaching compromises," Cuomo said. He pointed to a bill signed Tuesday in Albany to combat sexual assault on college campuses, achieved by "staying calm, not getting personal and finding commonality." De Blasio had sought permanent mayoral control of city schools, among other items, from state lawmakers. He reduced his target to three years. The Republican-led State Senate gave him one year. The mayor held back on publicly reacting to the slight until last week -- saying Cuomo and the legislature used mayoral control as a "political football." The mayor can return to Albany next year and be granted extended authority "if he does a good job," Cuomo said. De Blasio, on vacation with his family, returns Wednesday. "The mayor's comments from last week stand," de Blasio press secretary Karen Hinton said in a statement. "This most recent short-term extension breaks with the consensus on every end of the education and political spectrum that mayoral control works." City business groups and former Mayor Rudy Giuliani supported mayoral control. "It's clear that his style is to air his public frustration. Everybody has their own style," Cuomo said of de Blasio. "I try to bite my tongue once in a while on personal feelings." Asked about Republican former Sen. Alfonse D'Amato's offer to mediate their feud over an Italian meal, Cuomo balked. "I don't know how I feel about pasta summits," he said. "I know how I feel about pasta."